Lyon Eats: Cheese for Tex-Mex? I was wondering if you could tell me if you have found a substitue for cheddar cheese or even Monterey Jack that melts like they do? We have used Mimolette, which tastes fairly similar to mild cheddar - but I'm not sure how well it melts. I am wanting to make some Mexican food for friends and I normally use Jack Cheese, Pepper Jack, and Cheddar. Sharp cheddar usually. Is there anything you have found that melts like cheddar? How about that tastes like Monterey Jack? Personally, I like Gouda. It's fairly mild and melts pretty well. You can get Cheddar (as seen here) or, as K. said, some people find Mimolette works as a substitute. I've used Port Salut for a substitute for Jack cheese, it melted pretty good. Kari - I DID end up using Gouda for the quesidillas (it was delish!) 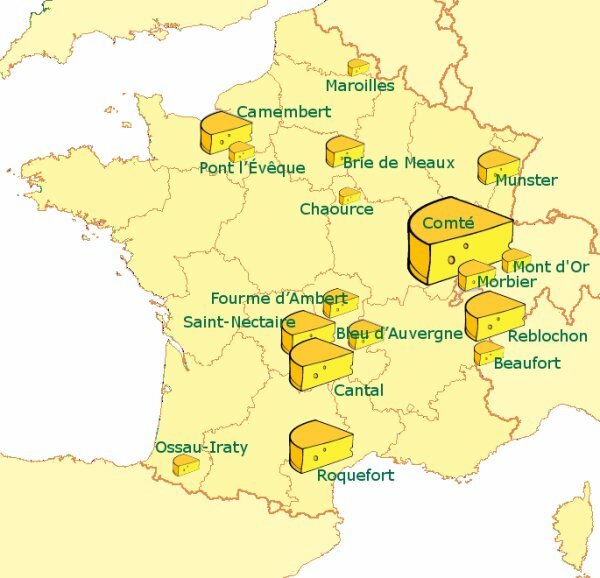 and I found cheddar in Monoprix, like you had suggested in one of your posts. It was white, so it didn't LOOK the same...BUT it had the flavor of a sharp cheddar - which was perfect. Haven't found the pepper jack - but I did love the Gouda. I had a conversation with the cheese stand owner at the regular Croix Rousse vegetable market. I asked him if he knew what the closest thing to cheddar would be. He told me that he actually use to sell cheddar when there was an English restaurant just around the corner. And then he recommended "laguiole", a variety of cantal cheese. He made me try it and I ended up buying some. I used it on some nachos tonight and was very pleased. If you think gouda is like sharp cheddar though, this would be more like extra sharp cheddar, especially before it's melted. I prefer sharp cheddar anyway. It took longer to melt in the microwave. The Port Salut was from another conversation with another cheese stand owner about what had a mild taste like babybel, but kept it's taste when heated, and melted well. Neither Port Salut or Laguiole are available in the cheese ailse. You have to go either to the cheese counter or to a cheese stand at the market or a cheese store. PS cheddar and other orange/yellow cheeses are made that color with annatto.